This isn't nearly as bad as this rap battle failure (NSFW language). It's still pretty bad, though. 1. Brady Hoke. The first year head coach has brought back a winning attitude and solid defensive play, things that were sorely missing for a few years. 2. Greg Mattison. The new defensive coordinator, brought back to Michigan after stints with the Florida Gators and Baltimore Ravens, took last season's defensive players, added a few freshmen, and concocted the #17 defense in the country. 3. Denard Robinson. The quarterback looked shaky at the beginning of the season while adjusting to offensive coordinator Al Borges's offense, but Robinson turned it on toward the end of the year. He's one of the most electrifying players in the entire country. 4. Mike Martin. The nose tackle had an excellent year for Michigan, especially in the second half of the season. More so than creating havoc inside, it was exciting to see the 6'2", 304-pounder chase down plays from sideline to sideline. Michigan hasn't had a nose tackle this athletic in my memory. 5. David Molk. The four-year starter at center won the Rimington Trophy, given to the nation's top snapper. It's a well deserved award for a quick and intelligent lineman with an old-school attitude. Thanks to all the Wolverines for working hard and giving us fans an exciting 2011 season. Hopefully even better things are to come in 2012, including a Sugar Bowl victory against Virginia Tech on Tuesday. Go Blue! Poll Results: Which freshman defensive back will have the best career? I accidentally let this post go by the wayside back in August, but the results are interesting, if only confirmation of what we already knew. It turns out that 75% of voters were right - Countess had the biggest impact. He developed into a starter and perhaps the best cover corner on the team. Greg Brown barely played before deciding to leave the team. Taylor played early in the season when Troy Woolfolk was hurt, but saw very little time down the stretch. Hollowell burned his redshirt late in the season just to run down the field on special teams. And Carter redshirted. The correct answer would have been Countess - Hollowell - Taylor - Brown - Carter, but the voters did a pretty good job for what was known. Greg Brown screwed up the voting by leaving mid-season, but it happens. Maybe we should re-think how advantageous it is for kids to enroll early; many of the recent early enrollees have struggled just as much as the average freshman. I'm not sure whether the actual name of this blog is "Tremendous" or "This Is Michigan Football" but thisismichiganfootball.blogspot.com snagged an interview with Ondre Pipkins, which is tre- . . . well, it's pretty good. Aquaman, the proprietor of the blog, is doing a solid job over at the site that I don't know the name of. The picture of Vanessa Castano is completely unrelated. I attended the Chesapeake Bowl last season to watch one of my former players participate, but unfortunately I won't be able to make it this year. Here's a link to the write-up from the 2010 contest, with thoughts on guys like Darian Cooper, Vincent Croce, Malcolm Crockett, Desimon Green, Darius Jennings, Sheldon Royster, and Jack Tabb. December 30, 2011 at 7:30 p.m.
Eddie Goldman - DT - Washington, D.C. Note: Although Brown, Diggs, and Goldman are listed as being participants, they have not been mentioned in any practice reports. They may be gearing up for the bigger all-star games instead. Left tackle Jeff Backus has started every Detroit Lions' game since the team drafted him with the 18th overall pick in 2001. That's eleven straight years and 175 consecutive games without missing a start, good for the longest streak in franchise history. All has not been sunny for Backus, however, as the Lions have been the laughing stock of the NFL over that time, with fans repeatedly calling for him to be replaced. I'm uncertain as to why Backus developed into everyone's favorite scapegoat for the Lions' woes, but it's nice to see this former Michigan athlete finally get a reprieve from ugly losses and fan criticisms. Against the Chargers on Christmas Eve, the Lions clinched their first playoff birth since 1999 and Backus played well: he didn't give up a single sack and paved the way for two third down conversions on third and short. "Detroit Lions offensive tackle Jeff Backus dominant against the San Diego Chargers," read an Mlive headline after the game while Pro Football Focus wrote,"Jeff Backus has really put together some nice performances as of late. 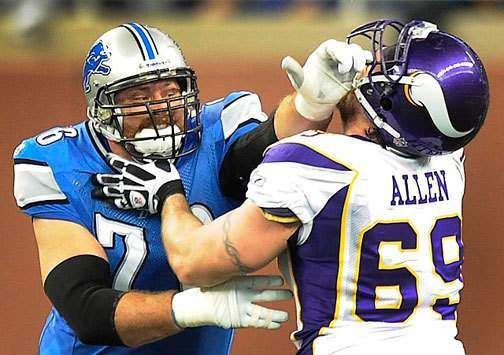 In the last five games, he has graded out as an 8.7 while only allowing one quarterback sack and one quarterback hit." After a challenging eleven year start to his NFL career, hopefully this is the sign of better things to come for Backus and his Lions. Honorable Mention: Brady again threw for 300 + yards last week as he lead the Patriots to their 12th victory of the season by overcoming a 17 point first half deficit to defeat the Dolphins, 27-24. Although on pace for much of the year, Tom Brady won't beak Dan Marino's 1984 single-season passing record of 5,084 yards because Drew Brees beat him to it, breaking the record on Monday Night Football. But with only 190 yards separating Brady and Brees, it's still possible for Brady to end this season with the record. Saints coach Sean Payton has a history of resting his starters in the second half of the final regular season game and may do so again with the Division already sewn up and nothing to gain if the 49ers take care of the lowly Rams as is expected. Miscellaneous: Braylon Edwards caught a nine yard pass on Sunday but was cut by the 49ers after the game. Morgan Trent, now with Jacksonville, recorded his second career interception last week to go along with four tackles. Jake Long returned from his biceps injury against the Patriots but left the game after re-aggravating it. Martell Webb was cut from Tampa Bay's practice squad. Jake Long, Tom Brady and Charles Woodson were named starters for the 2012 Pro Bowl. Starters: Redshirt freshman Jake Ryan (6'3", 230 lbs.) started 10 games at strongside linebacker; he ended the season with 30 tackles, 7 tackles for loss, 2 sacks, 1 forced fumble, and 2 fumble recoveries. Redshirt junior middle linebacker Kenny Demens (6'1", 248 lbs.) started every game and led the team in tackles; he finished with 86 tackles, 5 tackles for loss, 3 sacks, and 1 forced fumble. 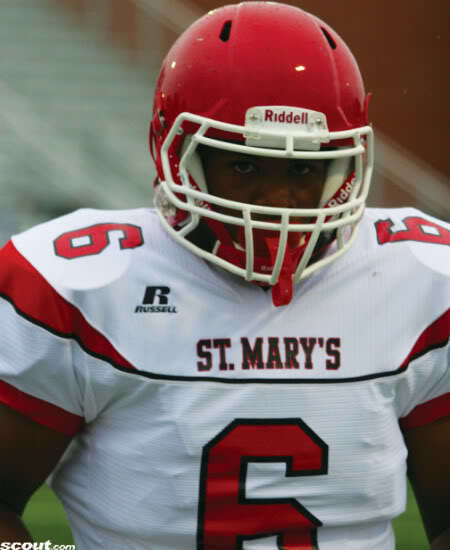 True freshman weakside linebacker Desmond Morgan (6'1", 220 lbs.) took over the starting job midway through the year and started 6 games altogether; he ended the regular season with 53 tackles, 2.5 tackles for loss, 1 sack, and 1 fumble recovery. Backups: True freshman Brennen Beyer (6'3", 225 lbs.) is the backup SAM and made 11 total tackles. Junior Brandin Hawthorne (6'0", 214 lbs.) is the backup WILL (and started 5 games before losing his spot), finishing with 43 tackles, 3 tackles for loss, 1 sack, and 1 interception. Demens rarely leaves the field. Starters: Redshirt sophomore middle linebacker Jack Tyler (6'0", 229 lbs.) made 3 starts on the season; he ended the year with 35 tackles, 2 tackles for loss, 1 sack, and 1 fumble recovery. Redshirt sophomore inside linebacker Tariq Edwards (6'2", 231 lbs.) started every game; he has 63 tackles, 9.5 tackles for loss, 2.5 sacks, 2 interceptions, and 1 fumble recovery. 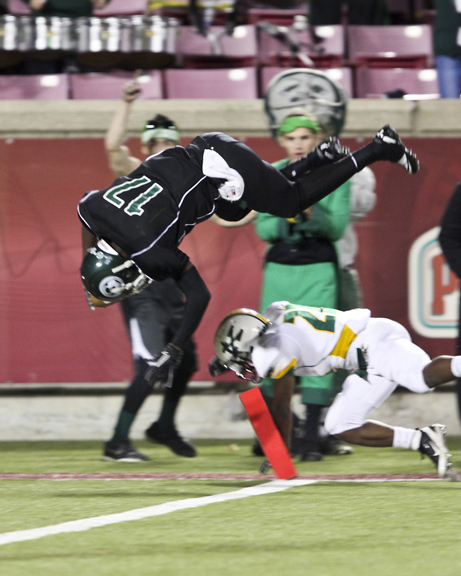 Sophomore cornerback Kyle Fuller (6'0", 187 lbs.) has started the last 2 games at weakside linebacker due to injuries, but started the other 11 games in the defensive backfield and was a Second Team All-ACC selection; he has 64 tackles, 14.5 tackles for loss, 4.5 sacks, 1 interception, 2 forced fumbles, and 1 fumble recovery. Tyler and Fuller are replacing injured starters Bruce Taylor and Jeron Gouveia-Winslow, respectively, who will also miss the Sugar Bowl. Backups: Fifth year senior middle linebacker Barquell Rivers (6'0", 250 lbs.) has 16 tackles, 1/2 a sack, and 1 interception. Redshirt junior outside linebacker Alonzo Tweedy (6'2", 189 lbs.) has 20 tackles, 3 tackles for loss, and 1 sack. It's tempting to say that Michigan has the advantage here, since all three starters have superior size and actually earned their positions rather than stepping in due to injury. Two of Virginia Tech's starters are replacements, although Fuller has started every game this season at various positions. But what Michigan has in game experience might be trumped by the playmaking ability of Edwards and Fuller, who have combined for 24 tackles for loss, 7 sacks, and 3 interceptions. And despite the relative health of Michigan's unit, two of those three starters are still just freshmen. The Hokies are #37 in the country in tackles for loss, while Michigan ranks at #72. Additionally, Virginia Tech has the #17 rushing defense, compared to Michigan's #34 rushing D. The Hokies might be small, but they're quick and they get to the ball. They have made their name on special teams and defense over the years, and defensive coordinator Bud Foster is a pretty good coordinator. They won't be able to keep up with Denard Robinson in a foot race, but they should create a nice challenge. 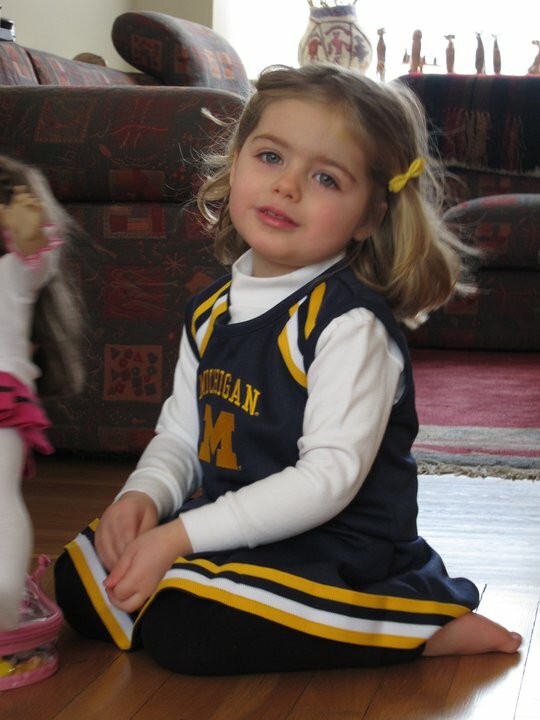 If you have any other pictures of girls wearing Michigan gear, drop me an e-mail. Starters: Fifth year senior strongside end Ryan Van Bergen (6'6", 288 lbs.) is a three-year starter and All-Big Ten Honorable Mention this past season; he finished the year with 41 tackles, 12 tackles for loss, 5 sacks, 1 forced fumble, and 3 fumble recoveries. Senior nose tackle Mike Martin (6'2", 304 lbs.) is also a three-year starter and has been Second Team All-Big Ten the past two seasons; he ended the regular season with 54 tackles, 5.5 tackles for loss, and 3 sacks. Fifth year senior defensive tackle Will Heininger (6'6", 295 lbs.) is a former walk-on who started for the first time this season; he has 23 tackles and 1 sack. Junior weakside end Craig Roh (6'5", 269 lbs.) is a three-year starter; he currently has 29 tackles, 8 tackles for loss, 4 sacks, and 1 forced fumble. Backups: The key backups are junior defensive tackle William Campbell (6'5", 322 lbs. ), sophomore defensive end Jibreel Black (6'2", 260 lbs. ), and freshman defensive end Frank Clark (6'2", 228 lbs.). Campbell mostly plays behind Martin and has 11 tackles, 2.5 tackles for loss, and 2 sacks on the season; there is a good chance Campbell will start due to a lower leg injury to Heininger. Black is Roh's platoon mate at weakside end and finished the regular season with 17 tackles and 1.5 sacks. Clark also plays weakside end and plays situationally, but provides a speedy matchup and made 5 tackles on the season. If Campbell does indeed start against Virginia Tech, that will increase playing time for redshirt sophomore defensive tackle Quinton Washington (6'4", 302 lbs. ), who has made just 1 tackle this season. Starters: Redshirt junior Antoine Hopkins began the year as a starting defensive tackle but tore his ACL halfway through the season. His sophomore brother Derrick (6'0", 301 lbs.) started every game at DT and finished with 50 tackles, 5 tackles for loss, 3 sacks, 1 forced fumble, and 1 fumble recovery. Freshman defensive tackle Luther Maddy (6'1", 283 lbs.) picked up for the elder Hopkins, notching 17 tackles, 2 tackles for loss, 1 sack, and 1 fumble recovery. Redshirt sophomore defensive end James Gayle (6'4", 257 lbs.) 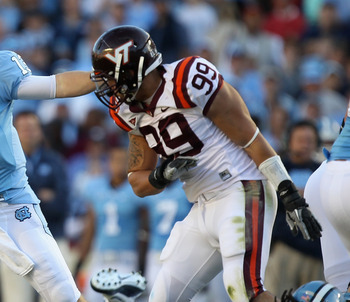 was named Second Team All-ACC after making 34 tackles, 11.5 tackles for loss, and 7 sacks. Redshirt sophomore J.R. Collins (6'2", 240 lbs.) made 50 tackles, 8.5 tackles for loss, 6 sacks, and 1 interception on the year and earned All-ACC Honorable Mention. Backups: Redshirt freshman defensive end Zack McCray (6'4", 264 lbs.) made 14 tackles and 1 tackle for loss on the year. Freshman defensive tackle Corey Marshall (6'1", 253 lbs.) has made 12 tackles and 2 sacks as a frequently used reserve. Redshirt junior defensive tackle Isaiah Hamlette (6'5", 291 lbs.) has made 7 tackles, 2 tackles for loss, and 1 sack on the year. Michigan definitely has an advantage in the size department, where the average Wolverines starter is about 19 lbs. 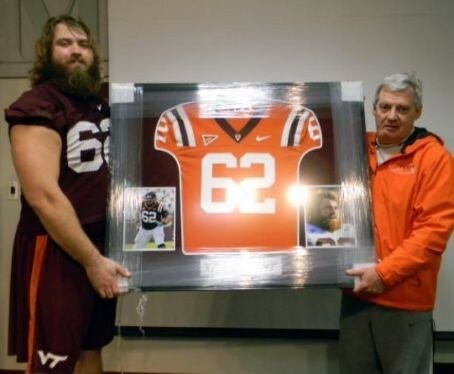 heavier than his Hokies counterpart. Virginia Tech is small, quick, and relatively young, since all four starters are sophomores or freshmen; conversely, Michigan has three seniors, and the only junior starter has been starting since his true freshman season. Although Campbell is a mammoth backup tackle, none of the backups has been exceptional for either squad. Size is important here, since Michigan's small-ish offensive line matches up against Virginia Tech's small-ish defensive line, and the Wolverines' large-ish defensive line goes up against a large-ish Hokies offensive line. The Hokies defensive line has helped them to rank #17 against the run (107.8 yards per game) and tie for #11 in sacks (2.92 per game), so despite the lack of size and experience, they are fairly effective. Gayle and Collins make a formidable pass rushing duo from the edges. Meanwhile, the Wolverines are #34 in rushing defense (129.1 yards per game) and #27 in sacks (2.33 per game). The numbers suggest the Hokies are stronger up front defensively, and the potential loss of Heininger will be a blow to a thin defensive line. AnnArbor.com posted an article on wide receiver Drew Dileo a couple days ago. As the only native Louisianan on the team*, he gets special treatment from the Ann Arbor media before the Wolverines play in New Orleans. *Running backs coach Fred Jackson is also from Louisiana, as was former Wolverines safety Carvin Johnson, who left the team earlier this season. as his Christopher Newport team almost finished in the top third of D-III defenses and the team went 8-3. Former head coach Rich Rodriguez spent the 2011 season as an NCAA football analyst for CBS Sports. Former offensive coordinator Calvin Magee spent the 2011 season as the offensive coordinator at Pitt. The Panthers finished the regular season #68 in rushing offense (151 yards per game), #75 in passing offense (211 yards per game), #83 in total offense (362 yards per game), and #69 in scoring offense (25.75 points per game). They also allowed more sacks than any other team with 4.75 per game. Magee has been hired to re-join Rodriguez at Arizona and coordinate the offense. Former defensive coordinator Scott Shafer ('08) has spent the last few seasons at Syracuse. In 2011 the Orangemen finished #32 in rushing defense, #98 in passing defense, #64 in total defense, and #74 in scoring defense. Former defensive coordinator Greg Robinson ('09-'10) spent the 2011 season away from football. Former quarterbacks coach Rod Smith ('08-'10) spent the 2011 season as the quarterbacks coach at Indiana. The Hoosiers went 1-11 with a victory over South Carolina State. True freshman Tre Roberson finished the season at 81-for-142 passing for 937 yards, 3 touchdowns, and 6 interceptions. He also ran the ball 109 times for 426 yards (3.9 yards per carry) and 2 touchdowns. Sophomore Edward Wright-Backer finished the year at 91-for-153 passing for 1,029 yards, 4 touchdowns, and 4 interceptions. He ran the ball 46 times for 68 yards and 0 touchdowns. Overall, the Hoosiers had the #80 passing offense, the #85 total offense, and the #101 scoring offense (21.4 points per game). Running backs coach Fred Jackson ('08-'10) spent the 2011 season at Michigan, turning Fitzgerald Toussaint into an awesome running back. Former wide receivers coach Tony Dews ('08-'10) spent the 2011 season as the tight ends coach at Pitt. Starter Hubie Graham finished the year with 27 catches for 307 yards and 3 touchdowns. Dews has been hired to re-join Rodriguez at Arizona as the wide receivers coach. Former offensive line coach Greg Frey ('08-'10) spent the 2011 season as the offensive line coach at Indiana. The Hoosiers finished #58 in rushing (161 yards per game) and #95 in sacks allowed (2.58 per game). 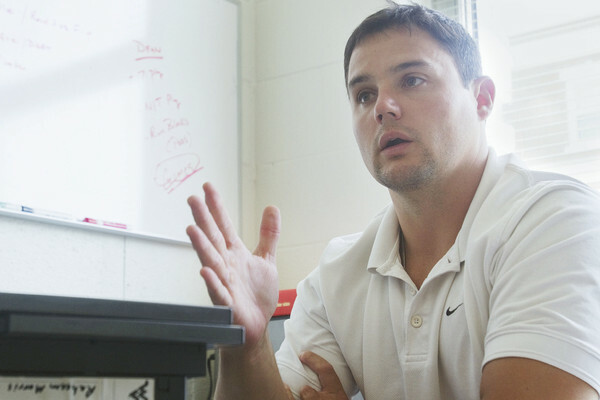 Former defensive line coach Bruce Tall ('08-'10) was hired as the defensive coordinator at Charlotte, a fledgling football program that won't begin playing until 2013. Former linebackers coach Jay Hopson ('08-'09) spent 2010 and the first part of 2011 at Memphis. However, he resigned at Memphis after the first two games of the season, when he gave up 59 and 47 points to Mississippi State and Arkansas State, respectively. His current job situation is unknown. Former secondary coach Tony Gibson ('08-'10) spent the 2011 season as the secondary coach at Pitt. The Panthers finished #71 in the country in pass defense (233 yards per game) and his defensive backs made just 4 total interceptions. Gibson has been hired to re-join Rodriguez at Arizona as the Wildcats' secondary coach. Former safeties coach Adam Braithwaite ('10) spent the 2011 season as the defensive coordinator at Christopher Newport, a Division III program. CNU finished #85 in rushing defense, #94 in pass defense, #83 in total defense, and #116 in scoring defense while going 8-3 on the year. There are 238 teams in Division III. Starters: Redshirt sophomore left tackle Taylor Lewan (6'8", 302) has started every game this season and was voted Second Team All-Big Ten by conference coaches. Redshirt junior left guard Ricky Barnum (6'3", 292 lbs.) has started three games this season and remained #1 on the depth chart all season despite missing all or part of the other nine contests. Fifth year senior center David Molk (6'2", 286 lbs.) received every conceivable award for a center, including First Team All-America status and the Rimington Trophy, given to the nation's top center. Redshirt junior right guard Patrick Omameh (6'4", 299 lbs.) has started every game this season. Fifth year senior right tackle Mark Huyge (6'6", 302 lbs.) has started every game this year. Backups: The only backup to see significant playing time this season was redshirt sophomore tackle/guard Michael Schofield (6'7", 299 lbs. ), who actually started more games (9) than Barnum at left guard. Schofield is a tackle by trade, but with Barnum consistently hurt, the coaches plugged him in and he's essentially a sixth starter. The next two backups appear to be redshirt junior tackle Elliott Mealer (6'5", 310 lbs.) and redshirt junior center Rocko Khoury (6'4", 287 lbs. ), who have played in seven and four games, respectively. Starters: Fifth year senior left tackle Andrew Lanier (6'5", 306 lbs.) is a two-year starter at left tackle. Redshirt junior left guard Greg Nosal (6'6", 297 lbs.) has started every game for the past two seasons and was Honorable Mention All-ACC in 2011. Redshirt sophomore center Andrew Miller (6'4", 290 lbs.) has started every game this season. Fifth year senior right guard Jaymes Brooks (6'2", 307) is a three-year starter and two-time Second Team All-ACC selection. Fifth year senior right tackle Blake DeChristopher (6'5", 311 lbs.) is a four-year starter with 50 career starts, was a First Team All-ACC selection and earned the ACC's top award for offensive linemen. Backups: True freshman Caleb Farris (6'3", 309 lbs.) has played in four games as a backup offensive center. Redshirt junior Michael Via (6'7", 292 lbs.) has played in eleven games as a backup guard and center this year, and also has past experience at tackle. Redshirt junior Nick Becton (6'6", 326 lbs.) has played in every game at offensive tackle. Via and Becton appear to be in line for starting jobs next season. Michigan might have more talent due to playing in the Big Ten, but experience is a key component in offensive line development, so . 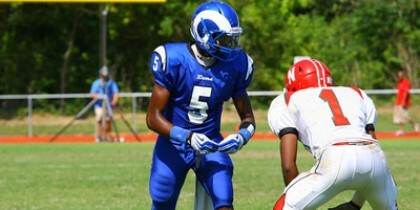 . .
St. Louis (MO) Ladue Horton Watkins wide receiver Jehu Chesson committed to Michigan last week. The 6'3", 185 lb. wideout is the 24th member of Michigan's class, leaving four more spots open. Here's a link to his commitment post. Murrietta (CA) Vista Murrietta safety Su'a Cravens, a 2013 prospect, has been offered by Michigan. Cravens is a 6'1", 205 lb. strong safety with offers from Arizona, Arizona State, Arkansas, Cal, North Carolina, Notre Dame, Oklahoma, Stanford, USC, Washington, and others. As a junior this past season, he had 96 tackles, 11 sacks, and 3 interceptions. Ramsey (NJ) Don Bosco Prep defensive end Al-Quadine Muhammad, a 2013 prospect, has also been offered by the Wolverines. He's 6'4", 230 lbs. and has offers from Boston College, Colorado, Notre Dame, Oklahoma, Rutgers, South Carolina, and others. Muhammad is the teammate of several Michigan targets from the 2012 class, including defensive back Yuri Wright. Lee's Summit (MO) Lee's Summet West offensive guard Evan Boehm re-committed to Missouri last week. The 6'3", 290-pounder, who is considered one of the best interior linemen in the country, de-committed from Missouri several weeks ago and flirted with going elsewhere, but he's sticking close to home. Texas linebacker Derek David has been re-classified as a 2014 recruit due to some legal issues stemming from an alleged sexual assault. He had been offered by Michigan early in the process, but never visited and had only limited contact with the Wolverines. David was committed to Texas Tech prior to his legal troubles. Eden Prairie (MN) Eden Prairie offensive tackle Nick Davidson committed to Stanford. The 6'6", 275 lb. lineman is the son of Jeff Davidson, an NFL offensive line coach and offensive coordinator who has floated around the league for several years. Monroe (NC) Sun Valley wide receiver Jody Fuller committed to South Carolina back in July. I happened to be on a two-week vacation at the end of July, which is probably why I never updated his status. Plus I never really cared about Fuller because he didn't show any interest in Michigan's offer. Inglewood (CA) Inglewood wide receiver Derrick Woods committed to Oklahoma back in November. I must have missed this news due to Thanksgiving and the excitement surrounding the Ohio State game, but the 6'1", 180 lb. speedster is off the board. Merry Christmas to everyone out there. I hope you all have a great holiday season and travel safely. Posting may be light for the next few days. I am busy ruining people's holidays, but that takes a lot of time and effort. I hope you are all having a horrible, horrible holiday season. Bah humbug. Ahhhhh . . . Michigan fans and MSU fans getting along. 'Tis the holiday season, I guess. If you have any other pictures of attractive Michigan fans wearing Wolverines gear, drop me an e-mail. Check out what Sport Science learned about Denard Robinson. Mailbag: Thoughts on OSU sanctions? one - it's practically falling apart! How embarrassing. Why didn't the NCAA drop the hammer on OSU? They knowingly cheated and the whole program was involved, yet it seems like they got off with a slap on the wrist. I have to admit that I've been struggling with the answer to this since the punishment was publicized a couple days ago. Ohio State's head coach was involved in a scandal that included not one, but several of his players. He sat on the information and allowed those players to continue to play. That's a big deal in "amateur" athletics. Or at least it should be. The real problem I have with this is that Ohio State doesn't seem to have received fair punishment compared to other programs that have recently been in trouble. USC got a two-year bowl ban for the Reggie Bush scandal that involved an assistant coach; they also lost 30 scholarships. Michigan got two years of probation and 130 lost practice hours for having practiced 65 hours too long, the old two-eyes-for-one-eye approach. Ohio State knowingly allowed Terrelle Pryor and others to play in last year's Sugar Bowl against Arkansas, a game the Buckeyes won. If there's a two-for-one mentality, Ohio State ought to be banned from bowl games for both the 2012 and 2013 seasons. The Buckeyes wouldn't have won that game against Ryan Mallett's Arkansas Razorbacks without Pryor, and though the game has been vacated, that doesn't erase recruits' and fans' memories of watching them win that game. Instead, the Buckeyes will only miss a bowl game in 2012. When I was growing up and got in trouble for not doing my chores, my parents didn't say, "Bad boy! Your punishment is that you have to do the chores now." What would that have taught me? Instead, I not only had to do my chores, but I had to go pull weeds in the garden or I wouldn't be able to play video games for a little while. Ohio State also should have been punished with more than the loss of nine scholarships. In addition to more players being involved at OSU than USC, the Buckeyes' head coach was involved, instead of just an assistant. I don't care that Jim Tressel is no longer with the program (more on that later). At the time of the infractions, he was the head coach. Ohio State president Gordon Gee and athletic director Gene Smith are responsible for hiring and controlling their subordinates, including Tressel. Just because Tressel stepped down doesn't mean that the institution should be rewarded because the offender decided to leave. It would be one thing if Gee and Smith fired Tressel, but they allowed him to resign. As for Tressel, I think the NCAA meted out a fair penalty. He was given a show cause sanction for five years, meaning that if any other NCAA program hires him, they might face sanctions themselves. It essentially means that he won't be able to get a college job until the 2016 regular season. Tressel turned 59 on December 5th, so if he were to return for 2016, he would be pushing 64. In addition to the penalty that the school might face, Tressel would be suspended for the first five games of any season between now and then, and he would be banned from coaching in a conference championship or bowl game. I suspect the chances of him getting a major college coaching job again are pretty slim, but he has been hired by the Indianapolis Colts as a consultant and I can see him maintaining a front office job in the NFL. Overall, I'm glad that the NCAA handed down a punishment, but it seems a little light. If I were in charge of deciding the sanctions, I probably would have given OSU three years of probation, 20 lost scholarships over three years, a two-year bowl ban, and a five-year show cause penalty for Tressel. St. Louis (MO) Ladue Horton Watkins wide receiver Jehu Chesson committed to Michigan on Wednesday. He picked Michigan over offers from Cincinnati, Illinois, Iowa, Missouri, Northwestern, Oklahoma State, Purdue, and others. He took official visits to Northwestern in October and Iowa last weekend. Chesson is 6'3", 180 lbs. with a 4.5-second forty yard dash. He's also a sprinter who notched a 37.44 time in the 300-meter hurdles. As a senior Chesson had 53 catches for 757 yards (14.6 yards per catch) and 6 touchdowns. He also made 57 tackles and 2 interceptions. As a junior in 2010, he had 60 receptions for 600+ yards and 12 touchdowns. Chesson originally visited Michigan's program in the summer of 2010, but obviously the coaching staff has changed since then. He received an offer from the new staff this past summer and visited at the end of July. He went quiet for a little while at the beginning of the fall, but news in recent weeks suggested that it was only a matter of time until Chesson committed to Michigan. The ratings for Chesson are pretty consistent, and yet I disagree with them. He's a 3-star to the four major recruiting services (ESPN, Rivals, Scout, and 247) and anywhere from the #51 to the #89 receiver. Chesson attends a school not known for producing great high school talent in a state that isn't typically very talented, but it's not Rhode Island, either - just this year Missouri boasts highly sought after recruits like Dorial Green-Beckham, Michigan commit Ondre Pipkins, and interior lineman Evan Boehm. At 6'3" Chesson has good height and at 180-185 lbs., he has a solid frame on which to add weight. He has good speed, but his ability to be a deep threat will be based more on his ability to high-point passes and outjump defenders. He also does an excellent job of catching the ball with his hands, rather than in his body. For all his positives, though, Chesson doesn't look like an elusive runner after the catch. He stops his feet on contact and often gets knocked backward. He's just not a quick-twitch athlete with the ability to change direction quickly. He'll be able to exploit a seam if there is one because he has decent straight-line speed, but I won't be expecting him to dance his way downfield after catching short passes. He needs to add size and should end up at a smidge over 200 lbs. He also needs to refine his route-running skills, because he tends to drift to certain areas of the field without trying to set up defensive backs. Overall, I have warmed up to Chesson throughout the recruiting process. Early on I thought he was just an average receiver, but the more film I've seen from his junior year, the more impressed I have become. Based on interviews and his behavior on the field, I also get the sense that he is a quality individual. Combined with his athletic talents, he ought to have a good career in Ann Arbor. Chesson is the second wide receiver in the 2012 class, following West Des Moines (IA) Dowling Catholic Amara Darboh. With Cincinnati (OH) Moeller wideout Monty Madaris setting a visit for January 13, it's possible that Michigan will take another player at the position, but wide receiver is no longer a priority. Added Utah DT Bryan Mone. "Great! 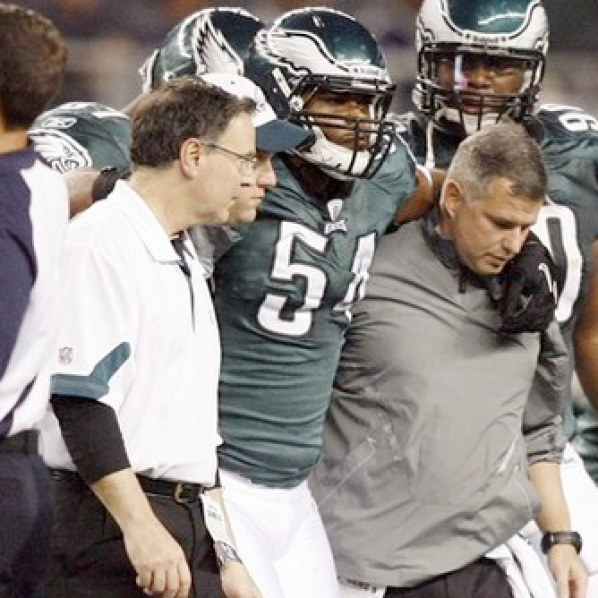 Now that I'm hurt, I won't have to wear green and white"
After recording only one tackle last Sunday, Brandon Graham is being selected as the Former Michigan Athlete of the Week for mostly symbolic reasons. Graham started six of the 13 games in which he played last season, recording 13 tackles, one sack and two forced fumbles. That was until week 14 against the Cowboys when Graham suffered a torn ACL and subsequently underwent microfracture surgery, which kept him on the Injured Reserve until late October of this year. Consistent with an injury of that severity, Graham's transition back to playing at a high level has not been seamless. And Philadelphia fans don't like that. As the 13th overall selection in the 2010 draft, Graham admits that he has not yet lived up to expectations. But Eagles fans are not a patient bunch and are directing some heat towards Graham, "chasing him off of Twitter" and bemoaning that his draft spot wasn't used to instead select Giants defensive end Jason Pierre-Paul, who, to his credit, has performed very well. “That's why it’s tough for me, because I gotta see stuff like that,” said Graham, “and I know I’m like, I could be that.’ I know what I can do. Just to see Pierre-Paul is balling, doing his thing, it’s tough on me...I don’t even worry about it because I’ve got three years and I’ve got a chance to prove myself and they know what I can do.” Graham continues to work hard and tweet. His Eagles hold a 6-8 record yet still have an outside chance of making the playoffs by winning the unimpressive NFC East. Honorable Mention: Tom Brady threw for 320 yards and two touchdowns with zero interceptions as the Patriots defeated the Denver Broncos and Tim "he just wins games" Tebow by a score of 41-23. 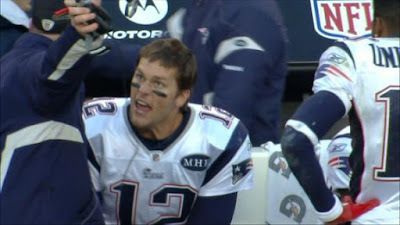 Brady added a touchdown on the ground which was followed by an emphatic spike as New England improved to an 11-3 record. Brady has thrown for 4,593 yards this season and is on pace to break Dan Marion's single-season passing record of 5,084 yards. That's if Drew Brees, who's thrown for 4,780 yards, doesn't beat him to it. But Brees' season total through the air may be adversely impacted by Coach Sean Payton, who unlike Belichick, has shown a tendency to rest his star players on the final week of the season if his team's playoff seeding has already been determined. Go Brady. Miscellaneous: Jake Long sat out against the Bills, which broke his 60 game start streak. Morgan Trent now plays for Jacksonville and saw action last week. Jay Feely hit a game winning field goal on Sunday against the Browns. I don't typically post links to articles about individual players, but this one is a pretty in-depth article about Fitzgerald Toussaint, an excellent football player who has flown somewhat under the radar even after posting a 1,000-yard season. After the 2009 recruiting class was signed, I said that Toussaint would be the best offensive player in the class. And while it seems Denard Robinson has taken the lead for that honor, Toussaint looks like a pretty nice second fiddle. Kevin Koger looks dapper in a suit that he stole from my closet. He can keep the tie, though. Starter: Senior Kevin Koger finished the season with 21 receptions for 235 yards (11.2 yards per catch) and 4 touchdowns. Koger has had an up-and-down career after earning the starting TE job as a true freshman in 2008. He has alternated amazing catches (see the 2009 Western Michigan game) with a frustrating number of drops. However, he's a solid and willing blocker who can be effective in the running game as an in-line blocker or in open space. Backups: Fifth year senior Steve Watson has been the second tight end for most of the season. 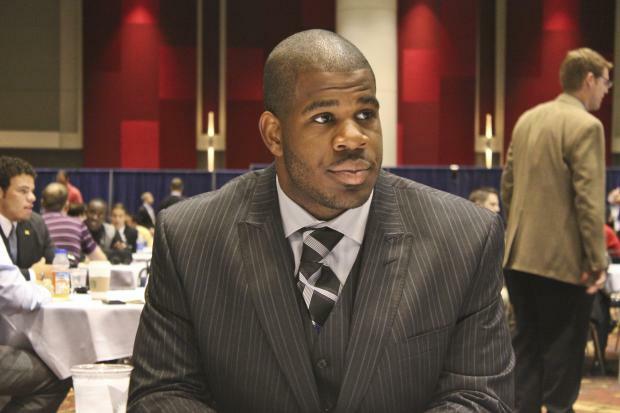 Watson has previously played outside linebacker and defensive end, too, before switching back to TE prior to the 2011 season; Watson's only career reception was a 9-yard touchdown against Northwestern. Redshirt junior Brandon Moore also caught 1 pass for 9 yards this season, but not for a touchdown. Moore is used mostly in short yardage and goal line situations. Starter: Fifth year senior Chris Drager is a 6'4", 264 lb. former defensive end. He started 11 games at defensive end in 2010 (stats: 34 tackles, 2 sacks) before switching to offense during the offseason. As one might expect from a former defensive player, he's a solid blocker, although his 14 total receptions for 186 yards (13.3 yards per catch) and 2 touchdowns aren't too imposing. Backups: Redshirt sophomore Eric Martin is a 6'2", 269 lb. blocking tight end with 2 catches for 17 yards (8.5 yards per catch) and 1 touchdown. Randall Dunn and George George (no, that's not a typo) have combined for 3 receptions, 47 yards, and 1 touchdown. The edge in athleticism goes to Kevin Koger, who not only has better stats but fits Michigan's spread-ish offense well and can get in the way downfield. Koger also has the ability to stretch the field with his above average speed. The Hokies' tight ends have a size advantage (all three Michigan tight ends are between 255-258 lbs.) and are effective blockers for running back David Wilson. Since it's tough to gauge blocking ability compared to receiving skills, I think a slight edge goes to . 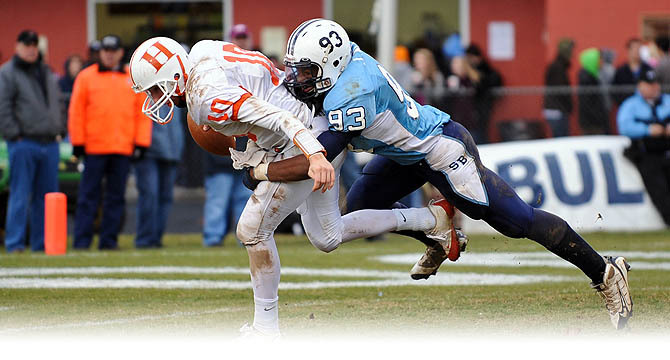 . .
Ashburn (VA) Stone Bridge DE Jonathan Allen, a 2013 prospect, received an offer from Michigan last week. Allen is 6'3", 225 lbs. and listed as a strongside end, although I think he could fit at weakside end as well. He plays a lot like 2012 commit Mario Ojemudia, although I think Ojemudia might be a little quicker. Allen comes up too high out of his stance and doesn't use his hands extremely well to shed blockers, but the physical talent is there to be a very good player. Boston College, Maryland, North Carolina State, Oklahoma, Virginia, and others have also extended offers. Pittsburgh (PA) Shaler Area TE J.P. Holtz was offered by Michigan, but it might be too late for the Wolverines. The 6'4", 240-pounder has already announced a top three of Michigan State, Pitt, and Purdue. He took a recent official visit to Pitt and reportedly enjoyed it, but the coaching situation might be a negative. Holtz said that he would like to be done with visits and has yet to make it to Ann Arbor, so chances are slim that he ends up wearing a winged helmet. Regardless, Holtz is a well rounded athlete who has played running back in high school, so he has running skills that some other tight ends don't possess. He could be an interesting pass-catching tight end to go along with the receiving skills of Devin Funchess and blocking of A.J. Williams. South Bend (IN) Washington RB David Perkins has a Michigan offer, at least according to Scout (Rivals insists he doesn't). The 6'2", 209 lb. athlete was committed to Notre Dame at one point, but decommitted at the end of October for reasons that are somewhat unclear. Perkins has offers from LSU, Michigan State, Missouri, Ohio State, and Tennessee, all of which he has visited or has scheduled a visit. Michigan's coaches are recruiting Perkins for running back now that Bri'onte Dunn appears to be off the table, and Perkins has discussed trying to set up a visit to Ann Arbor for January; that would likely cause him to have to cancel a trip to Ohio State, LSU, or Tennessee. Various schools are recruiting Perkins for various positions, including running back, wide receiver, and linebacker. He has a reported 4.43 forty yard dash and a 36" vertical leap, but he's kind of a raw athlete and reminds me of Josh Furman in some respects. 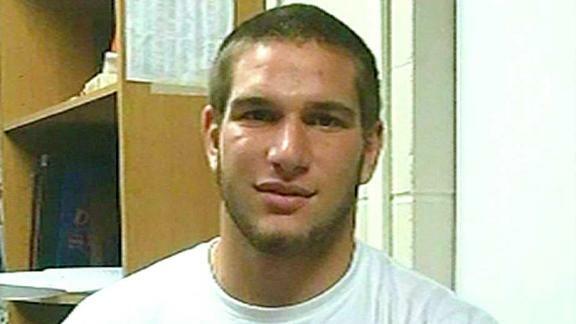 Peoria (IL) Manual OT Logan Tuley-Tillman, a 2013 prospect, was offered by Michigan last week. Tuley-Tillman is a 6'7", 280-pounder with a nasty streak. He's somewhat raw to be garnering such major offers, but he is a plus athlete. Unless he improves his technique and footwork significantly as a senior in high school, whichever college gets him will be getting a project. He also holds offers from Illinois, Indiana, Missouri, and Ohio State. Canton (OH) McKinley DE Se'von Pittman changed his allegiance from Michigan State to Ohio State. I can't say that I blame him, since MSU if full of criminals. Oh, wait. So is Ohio State. Pittman's heart never seemed to be in East Lansing, but academics were rumored to be an issue with Michigan and the impending sanctions seemed to push him away from OSU. I guess the hiring of Urban Meyer and the hope of winning a national championship was too much. If the NCAA ever gets around to sanctioning Ohio State, we'll see if their recruiting mojo remains. Glen Ellyn (IL) Glenbard West DT Tommy Schutt jumped out of the frying pan and into the fire last week, switching his future destination from Penn State to Ohio State. I guess we'll see in the next few years whether it was a good idea or not for Michigan to shun Schutt when he wanted to visit Ann Arbor, but my stance right now is that Schutt is going to be a load to deal with for the next several years. Meanwhile, Michigan might be a little thin on the interior. 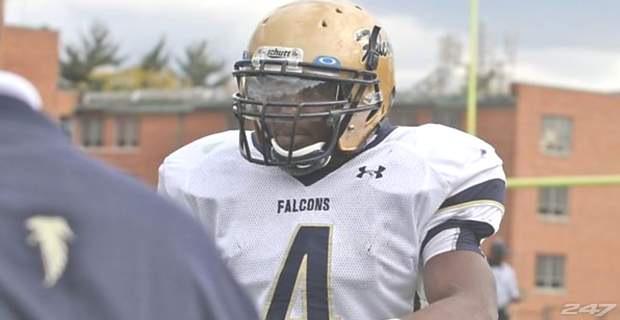 Harrisburg (PA) Bishop McDevitt DE Noah Spence committed to Ohio State on Sunday. It sure was a boon for Ohio State to get Urban Meyer as coach, because kids don't even care that the school is about to (or, well, should) get hit with NCAA sanctions. The 6'4", 245 lb. Spence is considered by many to be the nation's top defensive end. Michigan was never a viable option for Spence, but for a long time, it seemed OSU was out of the running, too. Watch 2012 defensive end Mario Ojemudia get after it during his senior season when Farmington Hills (MI) Harrison made an undefeated run through the regular season. Starters: The leading receiver is fifth year senior Junior Hemingway, who has caught 32 passes for 636 yards (19.9 yards per catch) and 2 touchdowns. Redshirt junior Roy Roundtree started all 12 games but finished fourth on the team in receptions, with just 18 for 342 yards (19.2 yards per catch) and 2 scores. Backups: Redshirt sophomore Jeremy Gallon popped out of nowhere to grab 30 passes for 450 yards (15.0 yards per catch) and 3 touchdowns; many of his receptions came on tunnel screens, although he made a few big catches downfield. Sophomore Drew Dileo made 9 receptions for 121 yards (13.2 yards per catch) and 2 touchdowns; he's a dependable receiver but rarely targeted. Senior Martavious Odoms' production dwindled once again to 7 receptions for 131 yards (18.7 yards per catch) and 3 touchdowns; he missed some time early in the year recovering from a broken wrist, but has still made some humongous catches for the Wolverines. Fifth year senior Kelvin Grady and sophomore Jeremy Jackson have combined for 7 catches, 100 yards, and 0 touchdowns. Starters: Senior Jarrett Boykin caught 57 passes for 731 yards (12.8 yards per catch) and 5 touchdowns. Boykin is 6'2", 218 lbs. and is Virginia Tech's career leader in receptions and receiving yards. Fellow receiver and fifth year senior Danny Coale grabbed 52 receptions for 787 yards (15.2 yards per catch) and 3 scores. Redshirt junior Marcus Davis started 7 games on the year and finished with 29 receptions for 499 yards (17.2 yards per catch) and 2 touchdowns. Backups: Junior D.J. Coles was the third leading receiver despite starting only 2 games; he caught 34 passes for 449 yards (13.2 yards per catch) and 3 touchdowns. Senior Dyrell Roberts, redshirt junior Corey Fuller, and redshirt freshman Willie Byrn combined for 6 receptions, 79 yards, and 0 touchdowns. Boykin and Coale offer a less explosive but more consistent pairing than do Hemingway and Roundtree. Michigan's early struggles in the passing game meant that the receivers didn't get much of a chance to catch the ball, because it was either horribly thrown or Robinson was running the ball. Hemingway, Roundtree, and even the 5'8" Jeremy Gallon were thrown plenty of jump balls and came down with their fair share, leading to the former two's averages of 19+ yards per catch. All three have shown the ability to run after the catch, but they don't get many chances to do so. Meanwhile, Virginia Tech quarterback Logan Thomas has been more consistent this season and has thrown the ball 389 times (compared to Denard Robinson's 237 attempts). That's why Boykin and Coale have caught more passes (109 total) than Michigan's entire wide receiver group (103). Check out some excellent highlights of 2012 linebacker James Ross, who will be attending Michigan next fall. He's never going to be a hulking middle linebacker, but watch how quickly he diagnoses plays and gets to the ballcarrier. It's going to be fun watching him take the field in Ann Arbor. What I've Been Reading . . .
Jon Krakauer, a recently discovered favorite. As I was reading my latest undertaking - Jon Krakauer's Under the Banner of Heaven - I started to come across the names of some places that had just recently entered my awareness, due to Michigan's recruitment of Salt Lake City (UT) Highland fullback Sione Houma. The book is mostly about the history of the Mormon religion, Mormon Fundamentalism, and the things people do for their religion. One of the proposed names for Utah Territory before it was established was "Deseret," which means "honeybee" in The Book of Mormon. TTB Andrew and I mined the Deseret News for weekly updates on Houma during his senior season; the paper happens to be owned by the church of the Latter-Day Saints. 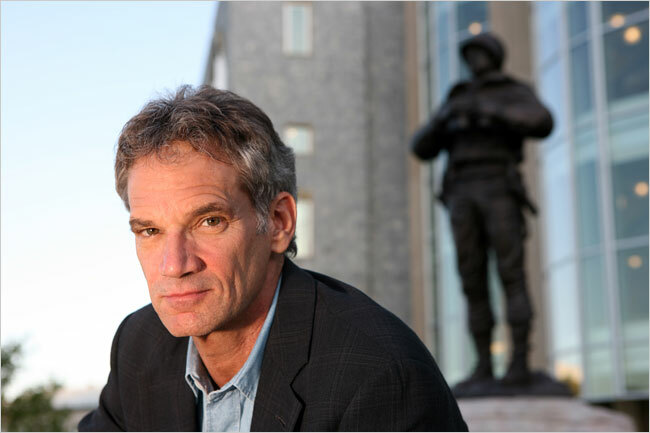 Under the Banner of Heaven by Jon Krakauer. The frame for the book comes from the 1984 murder of Brenda and Erica Lafferty, the wife and 15-month-old daughter of Allen Lafferty. Brenda and Erica were murdered by Allen's older brothers, whose polygamy and extreme Fundamentalist views were threatening the relationships and physical safety of many women and children in the Lafferty family. Krakauer reveals the run-up to the murders while simultaneously explaining the origins of the Mormon religion, beginning with the "prophet" Joseph Smith in the early 19th century. Having known very little about about Mormonism prior to picking up the book, I have found myself fascinated by how quickly and dangerously this off-shoot of Christianity has spread. Three and Out by John U. Bacon. Everybody and his brother has offered his thoughts on Three and Out, which is why I haven't posted in depth on my response to the book. Bacon follows Rich Rodriguez throughout his three years at Michigan, while also detailing some interviews with others inside the program. There's not much that gets revealed that devout Michigan fans didn't know already, but it's nice to get confirmation on some things that were thought to possibly just be internet rumors. It's clear that Rodriguez was playing catch-up from the time he was hired and had a snowball's chance in Hell to be successful. Rodriguez was somewhat guilty of failing to endear himself to Michigan people, especially with the way he got rid of so many Michigan staffers; rather than making appointments, workers who wanted to stay at Michigan had to wait in line to interview for a chance to keep their positions. It was a great book for a Michigan fan to read, but only if you like torturing yourself. The Neverending Story by Michael Ende. I'm not ashamed to admit that I still read children's books. I watched the movie as a kid but never realized back then that The Neverending Story was actually a book. It was surprisingly long and convoluted for a children's book, but it was pleasant nonetheless. It's the story of a world that is slowly disintegrating because nobody reads the book anymore. The only person who can save Fantastica is a fat, nerdy bookworm . . . like Manny from Modern Family. Or me. The Silence of the Lambs by Thomas Harris. This is an older book, but I was immediately transfixed by Anthony Hopkins' performance when I saw the film several years ago. Unfortunately, I never got around to reading any of the books by Harris, but this past summer, I read Hannibal and couldn't get enough. True crime has always been interesting to me, and while I'm not particularly fond of fictionalized crime novels, the Hannibal Lecter series has me enthralled. In case you're unfamiliar, a pathological serial killer in the form of Lecter helps a young FBI trainee find a fellow serial killer from behind bars. The Death of Bunny Munro by Nick Cave. I've always been a fan of Cave's music (Murder Ballads, anyone? ), but I was unimpressed by this literary effort. I kept waiting for the story to go into overdrive because I admire Cave's lyrics, but the story just kind of floated along until the anti-climactic ending. On the plus side, Cave did write the screenplay and soundtrack for The Proposition. Maybe I'll just stick to watching his movies and listening to his songs about death. Perusing the internet for info about Virginia Tech, I came across this article from Smart Football's Chris Brown on Dr. Saturday. Good stuff. Starter: Redshirt sophomore Fitzgerald Toussaint began the season alternating with junior Vincent Smith, but Toussaint quickly took the lead in the race to be the lead back. Toussaint finished the season with 174 carries for 1,011 yards (5.8 yards per carry) and 9 touchdowns. Toussaint has the toughness to break tackles, the stop-and-go moves to make people miss, and enough speed to be a breakaway threat. Sophomore fullback Stephen Hopkins has carried 11 times for 43 yards (3.9 yards per carry). Backups: Smith is the third down and change-of-pace back. He rushed the ball 49 times for 296 yards (6.0 yards per carry) and 2 touchdowns. Despite being only 5'6" and 172 lbs., he's the superior blocker. Smith has also caught 10 passes for 142 yards and 2 touchdowns. Senior Michael Shaw is the next guy in; he finished the regular season with 31 carries for 199 yards (6.4 yards per carry) and 3 touchdowns. Starter: Junior David Wilson has started all 13 games and finished the season with 266 carries for 1,627 yards (6.0 yards per carry) and 9 touchdowns. Wilson has also caught 21 passes for 126 yards (6.0 yards per catch) and 1 touchdown. Redshirt junior fullback Joey Phillips has 3 carries for 2 yards on the season with zero touchdowns; he has yet to catch a pass. Backups: Fifth year senior Josh Oglesby has 90 carries for 336 yards (3.7 yards per carry) and 6 touchdowns. Redshirt sophomore Tony Gregory has the next most carries with 16 for just 27 yards (1.7 yards per carry). Wilson is the more accomplished back. He leads Toussaint in yardage and yards per carry. Wilson has at least one explosive play (20+ yards) in 10 out of his 13 games, and his only sub-80-yard rushing effort of the season came against Clemson in the ACC Championship. Toussaint is also less effective and almost non-existent in the passing game (5 catches, 14 yards, 1 touchdown) than Wilson. Fortunately for Michigan the Wolverines have significantly more depth at the position with two backups who have starting experience and a fullback who can run a little bit, too. If there's an injury to either running back, Michigan is more able to withstand the blow. Running back play is largely dependent on the offensive line (which we'll discuss another day), but this is a near wash when both teams are at full strength. Wilson is not only the First Team All-ACC running back, but has also been voted the conference's top overall player and was recently voted to the All-America team. Toussaint would very likely have been All-Big Ten if not for the early-season platoon and missing one game due to injury. With a superior fullback and experienced, potentially explosive backups, I have to give the advantage to . . .
Move to Arizona? Yes, please. Magee coached the tight ends at Michigan while long-time Michigan coach Fred Jackson coached the running backs. The other coaches are taking the same roles they held in Ann Arbor. Blake Countess is the overwhelming choice for breakout defender of the year. Freshman cornerback Blake Countess is your clear winner. Countess started five games and played in eleven contests as a true freshman. Midway through the season, he seemed to have usurped the starting cornerback job from fifth year senior Troy Woolfolk, who suffered from nagging injuries all year. Countess finished the regular season with 36 tackles, 1 tackle for loss, 1 forced fumble, and 6 pass breakups (second on the team). Furthermore, Countess showed the promise to be a potential all-conference corner for the next two or three seasons. Redshirt freshman linebacker Jake Ryan received the next most votes. Ryan is a 6'3", 230 lb. SAM 'backer who started ten games. He made several timely big plays throughout the year, including forcing a fumble against San Diego State and causing an interception against Western Michigan that was returned 94 yards for a touchdown by Brandon Herron. Ryan has 30 tackles, 7 tackles for loss, 2 sacks, 2 forced fumbles, and 1 fumble recovery on the year. True freshman WILL 'backer Desmond Morgan finished third, despite starting more games than Countess. He led the team in tackles twice and finished the regular season with 53 tackles (fifth most on the team), 2.5 tackles for loss, 1 sack, and 1 fumble recovery. The 6'1", 220-pounder likely suffered damage in the area of public perception when he was juked and outrun multiple times by Ohio State quarterback Braxton Miller, but not many linebackers match up well with Miller in open space. Redshirt sophomore free safety Thomas Gordon surprisingly finished fourth in the voting, despite having a largely forgettable 23-tackle performance in 2010. Gordon started nine games at free safety and seemed to lose his job late in the season simply because the coaches didn't want to relegate Woolfolk to the bench. Gordon finished the regular season with 59 tackles (third on the team), 1.5 tackles for loss, 1 interception, 2 pass breakups, 4 fumble recoveries, and 2 forced fumbles. His interception was one of the highlights of the season when he expertly read a double pass against Eastern Michigan and made a one-handed pick. Gordon also has a knack for being around the ball, which is apparent with his 4 fumble recoveries. Sophomore cornerback Courtney Avery is down at the bottom, receiving only two of the votes. Avery started only two games at cornerback, but he made several big plays. One was an 83-yard fumble return for a touchdown against Minnesota. He also made two impressive interceptions - the game-clinching one against Ohio State and another nice one against Purdue - to finish tied for first on the team in that category. Avery's regular season stats include 24 tackles, 1.5 tackles for loss, 1/2 a sack, 2 interceptions, 2 fumble recoveries (1 for a touchdown), and 1 forced fumble. There was one vote for "Other" but I'm not sure which player earned that vote. In order, my ballot would be Desmond Morgan, Blake Countess, Thomas Gordon, Jake Ryan, and Courtney Avery. Morgan earned the starting job over several contenders, including a senior (Herron), a junior (Brandin Hawthorne), and others. There were some bumps along the way, but he acquitted himself well. I already expected good things from Countess from when he was recruited, so his success wasn't really a "breakout" to me; I also expected good things from Morgan, but not quite so soon. Gordon had more experience than either of those freshmen, but he watched from the sideline for most of 2010 and still turned into a big-play guy who filled up the stat sheet. Ryan made some big plays, but also has some chinks in the armor. He will be good soon, but 30 total tackles is a little underwhelming for a linebacker. You could make a case that Avery deserves to be higher, and I might not argue; Michigan is in decent shape if he's the nickel corner. With Dennis Erickson's firing from Arizona State, that left a void in Tempe. Enter Todd Graham, who went 6-6 as Pitt's head coach this past season. Graham is a former defensive assistant under Rich Rodriguez at West Virginia; they now happen to be in-state rivals. Coaching changes rarely seem to pay dividends for Michigan, but if you're interested in speculation, this could re-open the door for Pittsburgh (PA) Fox Chapel Area OT Adam Bisnowaty, who was being pursued by Michigan prior to committing to Pitt. While Bisnowaty is the only Michigan offeree to be committed to Pitt, the Panthers also have verbals from Aliquippa (PA) Hopewell RB Rushel Shell and Cleveland (TN) Cleveland QB Chad Voytik. Shell has a particularly impressive offer list, and Canton (OH) GlenOak's Bri'onte Dunn recently re-affirmed his commitment to Ohio State, leaving the door open for Michigan to search elsewhere for a running back. Meanwhile, Voytik had expressed interest in Michigan, but it was unrequited. If the Wolverines decide to pursue a quarterback before February, Voytik might be a prime candidate. Brady threw for 357 yards and three touchdowns with one interception as his Patriots defeated the Redskins, 34-27, on Sunday. After throwing the interception, Brady joined in a profanity-filled shouting match with offensive coordinator Bill O' Brien (watch it here). Maybe the two were merely venting their frustrations with New England's awful defense because the passing game appears to be the least of their worries. Brady has thrown for 4,273 yards through 13 games and is on pace to break Dan Marino's 1984 single-season passing record of 5,084 yards if Drew Brees doesn't beat him to it. This Sunday, Brady will go head-to-head with quarterback media darling Tim "he just wins games" Tebow. Honorable Mention: Mario Manningham caught a 47-yard touchdown pass in the Giants 37-34 win over the Cowboys on Sunday Night Football, but the reception was due to a blown coverage, and he later dropped what would have been the game-winning touchdown pass. So Honorable Mention goes to Charles Woodson this week, who recorded six tackles, two pass defenses and an interception, which puts him in a tie with Eric Weddle and Kyle Arrington for most INTs this season (7). His Super Bowl defending Packers remain undefeated (13-0) after a 46-13 rout of Woodson's former team, the Oakland Raiders. Miscellaneous: Jake Long left the Miami-Philadelphia game with a lower back injury in the first quarter. The Dolphins gave up a franchise-tying nine sacks in his absence, and Coach Tony Sparano was fired after the game. Long's status for next week against the Bills is uncertain, which may end his 60 game start streak. Martell Webb signed with the Tampa Bay practice squad late last week. In case you can't tell, I really like Smart Football. Chris Brown posted about a topic relevant to Michigan currently, because Michigan is in the middle of switching from the spread offense to a pro-style offense. 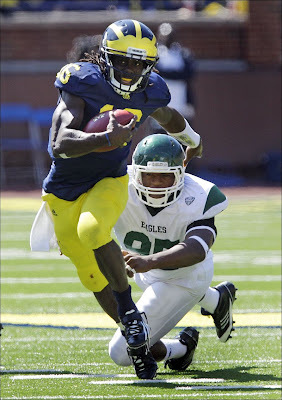 Starter: Junior Denard Robinson (6'0", 195 lbs.) is 133/237 (56.1%) passing for 2,056 yards, 18 touchdowns, and 14 interceptions. He has also rushed 208 times for 1,137 yards (5.6 yards per carry) and 16 touchdowns. Backups: Sophomore Devin Gardner has played in 9 games, sometimes in a package with Robinson on the field. Gardner is 11/23 (47.8%) passing for 176 yards, 1 touchdown, and 1 interception. He also rushed 25 times for 53 yards and 1 touchdown. The next guy on the depth chart is true freshman Russell Bellomy, who has yet to play this season but has traveled to road games. Starter: Redshirt sophomore Logan Thomas (6'6", 254 lbs.) has started all 13 games this season, going 215/363 (59.2%) for 2,799 yards, 19 touchdowns, and 9 interceptions. He has also rushed 137 times for 416 yards (3.0 yards per carry) and 10 touchdowns. Backups: Redshirt freshman Mark Leal has played a backup role in 3 games this year. He is 9/13 (69.2%) for 153 yards, 2 touchdowns, and 0 interceptions. Redshirt junior Ju-Ju Clayton is the third quarterback but has yet to play this season. Thomas is capable of excellent play; against Miami he went 23/25 (92%) for 310 yards and 3 touchdowns through the air, plus 2 more rushing scores. He played some great football throughout the year. But he's coming off a game against Clemson in which he completed 50% of his passes, threw 2 interceptions, and rushed 12 times for only 2 yards. Meanwhile, Robinson is one of the most dynamic players in the country, capable of taking over a game at any given time. While he has been prone to interceptions and erratic passing, he's coming off a three-game winning streak in which he completed 60% or more of his passes, scored 11 total touchdowns (5 passing with only 2 interceptions), and played arguably the best game of his career against Ohio State (14/17 for 167 yards and 3 touchdowns, plus 170 yards on the ground and 2 more touchdowns). Thomas is good, but Robinson has the ability to be unstoppable. Mailbag: How do you want the class to finish?